Why is the Fed Not Printing Like Crazy? I try to read all sides of the economics blogosphere, and try and grasp the ideas of even those who I would seem to radically disagree with. One thing that the anti-Fed side of the economics blogosphere seems to not fully appreciate is the depth of disappointment with Ben Bernanke from the pro-Fed side. For every anti-Fed post bemoaning Bernanke’s money printing, there is a pro-Fed post bemoaning Bernanke for not printing enough. Bernanke, it seems, is tied to everybody’s whipping post. And in fairness to the pro-Fed side, the data shows that the Fed is not printing anywhere near as much as its own self-imposed interpretation of its mandate demands. (Of course, I fundamentally disagree that price stability should be interpreted as consistent inflation, but that is an argument for another day). Recall that the Fed tries to keep inflation close to 2.0% and unemployment close to about 5.6% (the Fed’s current estimate of the natural rate.) One implication of the dual mandate is that they should try to generate above 2% inflation during periods of high unemployment, and below 2% during periods of low unemployment. In July 2008 unemployment rose above 5.6%, and it’s averaged nearly 9% over the past 46 months. So the Fed’s mandate calls for slightly higher than 2% inflation during this 46 month slump. Last month I reported that the headline CPI had risen 4.6% in the 45 months since July 2008. Now we have the May data, and the headline CPI has gone up 4.3% in the 46 months since July 2008. So the annual inflation rate over that nearly 4 year period has fallen from a bit over 1.2%, to 1.1%. 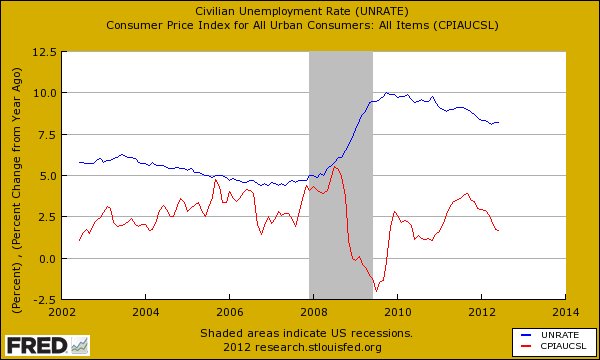 Note that downward slope in inflation into 2012? That’s the Fed not doing QE3 when everyone (especially gold prices) expected them to, and when their own self-imposed interpretation of their mandate calls for them to inflate more. 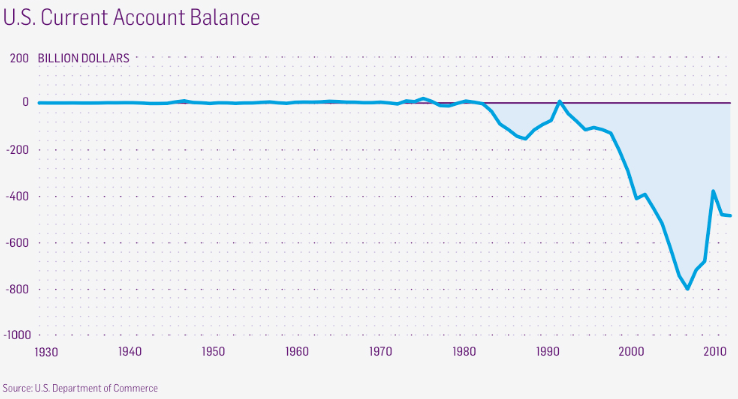 And nobody can say that the Fed is out of bullets; central banks are never out of bullets — there was a time when a central bank was limited to the number of zeroes it could fit on a banknote, but in the era of digital currency, even that limit has been removed. Franklin D. Roosevelt was elected President of the United States in 1932 with the mandate to get the country out of the Depression. In the end, the most effective actions he took were the same that Japan needs to take — namely, rehabilitation of the banking system and devaluation of the currency to promote monetary easing. But Roosevelt’s specific policy actions were, I think, less important than his willingness to be aggressive and to experiment— in short, to do whatever was necessary to get the country moving again. Many of his policies did not work as intended, but in the end FDR deserves great credit for having the courage to abandon failed paradigms and to do what needed to be done. Japan is not in a Great Depression by any means, but its economy has operated below potential for nearly a decade. 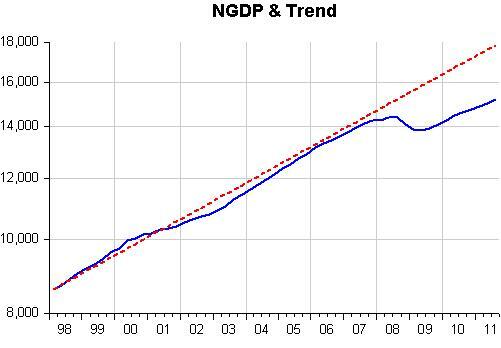 Nor is it by any means clear that recovery is imminent. Policy options exist that could greatly reduce these losses. Why isn’t more happening? Bernanke was and is a fine economist. More than that, before joining the Fed, he wrote extensively, in academic studies of both the Great Depression and modern Japan, about the exact problems he would confront at the end of 2008. He argued forcefully for an aggressive response, castigating the Bank of Japan, the Fed’s counterpart, for its passivity. Presumably, the Fed under his leadership would be different. Instead, while the Fed went to great lengths to rescue the financial system, it has done far less to rescue workers. The U.S. economy remains deeply depressed, with long-term unemployment in particular still disastrously high, a point Bernanke himself has recently emphasized. Yet the Fed isn’t taking strong action to rectify the situation. It really makes no sense — except in terms of politics. I really believe that we have reached a point where the Fed is afraid to do its job, for fear of being accused of helping Obama. I am fairly certain the answer to why Bernanke isn’t increasing inflation when his former self and former colleagues say he should be is actually nothing to do with domestic politics, and everything to do with international politics. Most of the pro-Fed blogosphere seems to live in denial of the fact that America is massively in debt to external creditors — all of whom are frustrated at getting near-zero yields (they can’t just flip bonds to the Fed balance sheet like the hedge funds) — and their views matter, very simply because the reality of China and other creditors ceasing to buy debt would be untenable. Why else would the Treasury have thrown a carrot by upgrading the Chinese government to primary dealer status (the first such deal in history), cutting Wall Street’s bond flippers out of the deal? “The United States provoked a trade war again by imposing high anti-dumping duties on Chinese-made gift boxes and packaging ribbon. China has become the biggest victim of the U.S.’s abusive implementation of trade remedy measures. The United States no longer sits still; it frequently uses evil tricks to force China to buy U.S. bonds. A crucial move for the U.S. is to shift its crisis to other countries – by coercing China to buy U.S. treasury bonds with foreign exchange reserves and doing everything possible to prevent China’s foreign reserve from buying gold. 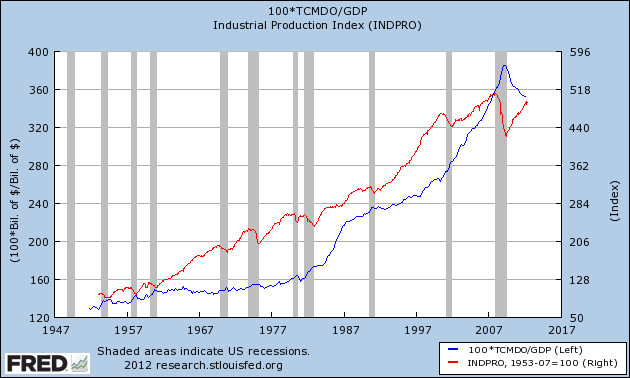 And that, in a nutshell, is why Bernanke is not printing nearly as much as Krugman wishes. In my view only a brutal 2008-style collapse can bring on the kind of printing — QE3, NGDP targeting and beyond — that the pro-Fed blogosphere wishes to see, because it is only under those circumstances that China and other creditors will happily support it. To a heavily-indebted nation, creditors have big leverage on monetary policy. This “safe haven” status can be discerned in the strengthening U.S. dollar. Despite a central bank (The Federal Reserve) with an avowed goal of weakening the nation’s currency (the U.S. dollar), the USD has been in an long-term uptrend for a year–a trend I have noted many times here, starting in April 2011. All this suggests a “decoupling” of the U.S. bond and stock markets from the rest of the globe’s markets. Put yourself in the shoes of someone responsible for safekeeping $100 billion and keeping much of it liquid in treacherous times, and ask yourself: where can you park this money where it won’t blow up the market just from its size? What are the safest, most liquid markets out there? Smith is going along with one of the most conventional pieces of conventional wisdom: that in risky and troubled times investors will seek out the dollar as a haven. That’s what happened in 2008. That’s what is happening now as rates on treasuries sink to all-time-lows. And that’s what has happened throughout the era of petrodollar hegemony. But the problem with conventions is that they are there to be broken, the problem with conventional wisdom is that it is there to be killed, roasted and served on a silver platter. The era of petrodollar hegemony is slowly dying, and the assumptions and conventions of that era are dying with it. For now, the shadow of that old world is still flailing on like Wile E. Coyote, hovering in midair. We know the U.S. is a big and liquid (though not really very transparent) market. We know that the rest of the world — led by Europe’s myriad issues, and China’s bursting housing bubble — is teetering on the edge of a precipice, and without a miracle will fall (perhaps sooner, rather than later). But we also know that America is inextricably interconnected to this mess. If Europe (or China or both) disintegrates, triggering (another) global default cascade, America will be stung by its European banking exposures, its exposures to global energy markets and global trade flows. Simply, there cannot be financial decoupling, not in this hyper-connected, hyper-leveraged world. And would funds surge into US Treasuries even in such an instance? Maybe initially — fund managers have been conditioned by years of convention to do so. 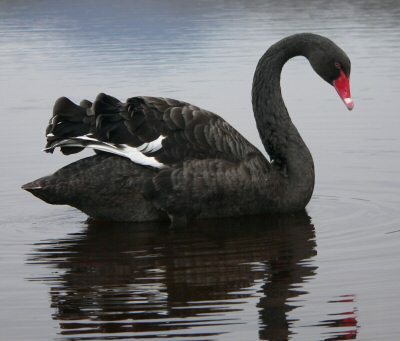 But how long can fund managers accept negative real rates of return? Or — much more importantly — how long will the Fed accept such a surge? The answer is not very long at all. Bernanke’s economic strategy has been focussed on turning treasuries into a losing investment, on the face of it to “encourage risk-taking” (or — much more significantly — keep the Treasury’s borrowing costs cheap). All of this suggests a global crash or proto-crash will be followed by a huge global money printing operation, probably spearheaded by the Fed. Don’t let the Europeans fool anyone, either — Germany will not let the Euro crumble for fear of money printing. When push comes to shove they will print and fiscally consolidate to save their pet project (though perhaps demanding gold as collateral, and perhaps kicking out some delinquents). China will spew trillions of stimulus money into more and deeper malinvestment (why have ten ghost cities when you can have fifty? 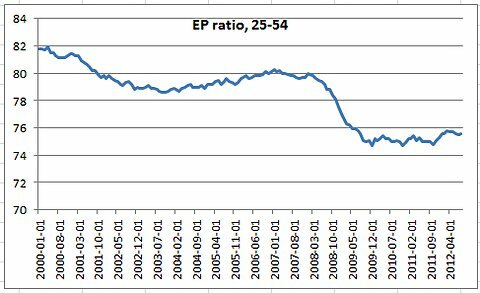 Good news for aggregate demand!). So Paul Krugman will likely get something much closer to what he claims to want. Problem solved? Nope. You can’t solve deep-rooted structural problems — malinvestment, social change, deindustrialisation, global trade imbalances, systemic fragility, financialisation, imperial decline, cultural stupefaction (etc, etc, etc) — by throwing money at problems. All throwing more money can do is buy a little more time (and undermine the currency). The problem with that is that a superficial recovery fools policy-makers, investors and citizens into believing that problems are fixed when they are not. Eventually — perhaps slowly, or perhaps quickly — unless the non-monetary problems are truly dealt with (very unlikely), they will boil over again. As the devaluation heats up things will likely become a huge global game of beggar thy neighbour. A global devaluation will likely increase the growing tensions between the creditor and debtor nations to breaking point. Our current system of huge trade imbalances guarantees that someone (the West) is getting a free lunch , and that someone else (the Rest) is getting screwed. Such a system is fundamentally fragile, and fundamentally unstable. Currency wars will likely give way to economic wars, which may well give way to subterfuge and proxy wars as creditors seek their pound of flesh, and debtors seek to cast off their chains. Good news, then, for weapons contractors and the security state. 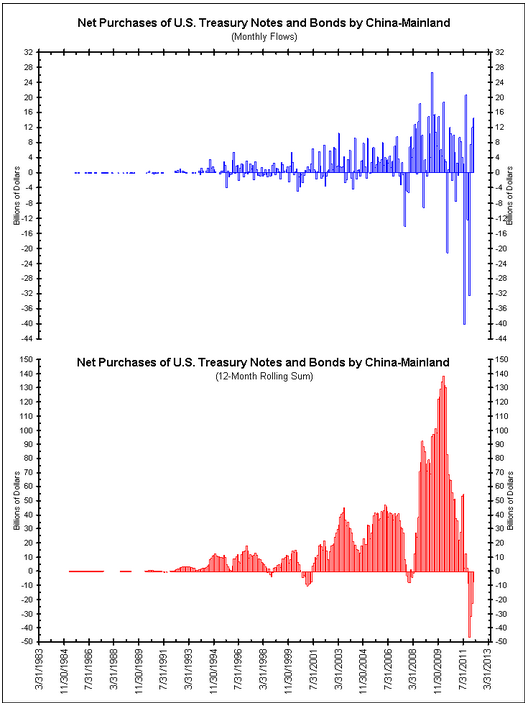 Is China Really Liquidating Treasuries? The news that China has become the first sovereign to establish a direct sales relationship with the U.S. Treasury (therefore cutting out the middleman and bypassing Wall Street ) raises a few interesting questions. China can now bypass Wall Street when buying U.S. government debt and go straight to the U.S. Treasury, in what is the Treasury’s first-ever direct relationship with a foreign government, according to documents viewed by Reuters. The relationship means the People’s Bank of China buys U.S. debt using a different method than any other central bank in the world. The other central banks, including the Bank of Japan, which has a large appetite for Treasuries, place orders for U.S. debt with major Wall Street banks designated by the government as primary dealers. Those dealers then bid on their behalf at Treasury auctions. China, which holds $1.17 trillion in U.S. Treasuries, still buys some Treasuries through primary dealers, but since June 2011, that route hasn’t been necessary. The documents viewed by Reuters show the U.S. Treasury Department has given the People’s Bank of China a direct computer link to its auction system, which the Chinese first used to buy two-year notes in late June 2011. Which begs the question for some analysts — was China really selling? Or was China stealthily buying direct from the U.S. Treasury (unrecorded) and selling back into Wall Street (recorded)? Well, according to the Treasury, the Treasury International Capital data seeks to record foreign holdings of U.S. securities, not just the flows, and given that the Treasury was the seller in these direct transactions (and so obviously was aware of them) there’s no reason to believe that they wouldn’t include any such direct outflows in the data. That suggests very strongly that yes, China really was selling. And maybe the real reason that the Treasury offered China direct access (thus cutting out the middleman and offering China cheaper access than ever) was precisely because China was selling, and because the Treasury was concerned about the effect on rates, and wanted to give China some incentive to keep buying. As Jon Huntsman noted in a 2010 cable leaked by Wikileaks, the PBOC has felt pressured to keep buying, and as various PBOC officials have hinted in recent months, China is actively seeking to convert out of treasuries and into gold. And that makes sense — treasuries are yielding ever deeper negative real rates. People holding treasuries are losing their purchasing power. No wonder the treasury is willing to cut Wall Street out of the deal. And it isn’t like the Treasury would have taken this move lightly — cutting Wall Street out of the equation is a slap in the face to Wall Street.